The healthcare field is divided up into several different areas that all play a role in the effective operation of healthcare facilities and the fair treatment of patients. Hospitals are responsible for providing care to hundreds of people per day, which makes the need for educated professionals and practitioners extremely high in this field. Most people are familiar with the practitioners and licensed professionals that work hard to ensure patient health in these busy settings, but there are people working behind the scenes that ensure that hospital employees receive the right type of treatment as well. Hospital human resources professionals are responsible for the intake, training, and maintenance of employees within these facilities. At the onset of operation, human resource professionals may post job openings in order to fill positions within their hospital. They may also review applications and make decisions about who should be hired and who should not. Training and development is a big responsibility of professionals in this field, as well as maintenance of employee healthcare and rights. The MHA - Hospital Human Resources degree program is a great option for people that want to become involved in the field of healthcare, but do not want to choose a practice-related career path. This degree program can help students learn more about what is involved in the human resources career path and steps to take to ensure that employees receive the right type of treatment from their employers and receive ample information about their rights as an employee. The guide below was created by our team of educational experts, who have years of experience with reviewing and reporting about educational programs in various specialty fields. This guide was created to help you gain a better understand of the educational programs that have been created for this field, as well as the income expectations and job titles that are related to it. If you are interested in pursuing this educational path, the information below can help you learn more about what this program consists of and what you can look forward to in your future. Students that are looking into this degree program are often concerned with what topics that might be introduced to. Some individuals that are entering into this degree program have little to no experience in the field of human services, meaning the curriculum some have some introductory aspects as well as those that dive deeper into healthcare and human resources. The courses that are listed below have been taken from open and active degree programs in hospital human resources. As you can see, there are topics that describe the management process that takes place in human resources, as well as courses that help outline the specific duties of professionals that work in these positions. Human Resources Management: This course outlines the duties of the human resources professional in the healthcare environment. Certain key aspects of this profession may be detailed, such as the recruitment of new employees, training, compensation, and conflict resolution. Issues such as diversity, sexual harassment, and regulations may also be discussed as students progress through this course. Employee Recruitment and Retention: Students that are enrolled in this class can learn more about the actual recruitment process, methods for attracting the right types of employees, and arranging fair compensation. Trends in the labor force may also be a topic of interest in this course, as well as strategies for growth and long-term retention of employees. Law and Ethics in Human Resources: It is vital for human resources professionals to comprehend the legal and ethical foundation of their position. This course outlines the various guidelines set forth for employers, such as the Civil Rights Act of 1964 and 1991 and the Equal Opportunity Act. These may serve as a foundation of learning for professionals that seek to provide a workplace that is open to all people. A lot of students choosing to enroll in masters-level programs are currently employed and looking for something to advance their career. With that being mentioned, it is easy to understand why the length and cost of programs may be such an important aspect during the choice process for upcoming students. Different degree programs can have different methods of charging students for tuition, books, and fees. As you search for the right program, you should ensure that you are taking these factors into consideration, so that you do not miss anything when planning financially. The colleges in the list below offer degree programs that can help you on your path to becoming a human resources professional in hospitals all over the country. Each of the universities listed below have reputable degree programs that can help you learn more about your role in the healthcare field, and the importance of ample care for employees within this setting. Review the list below to learn more about how long it can take you to complete these programs and how much you can expect to pay for your degree. It should be noted that these are estimates pulled from their respective websites and credit hour program length can change regularly. Human Resources Manager: Human resource managers are leaders within the human resources department in their organizations. Their duties may include overseeing a team of human resource professionals, providing reports and standings to upper members of management, and acting as part of the leadership team for hospitals or medical facilities. These professionals may also be responsible for recruiting and training members of the human resources team for their organization. Human Resources Professional: Human resource professionals are the “boots on the ground” of the healthcare human resources field. These professionals may be active in interviewing, training, and arranging benefits for employees that come to work for their agency. Depending on the size of the hospital, these professionals may work individually or in large groups. Employee Training and Development: Professionals that take positions in training and development may be solely responsible for ensuring that new employees receive the right type of training to start their positions. This can include introducing company history, expectations, and job responsibilities. For existing employees, training specialists may be responsible for introducing new policies or ideas that are required for healthcare organizations to abide by. Compensation and Benefits Manager: In some larger hospitals and healthcare facilities, human resource professionals may be responsible for undertaking individual tasks within their human resources teams. Compensation and benefits managers may focus specifically on enrolling employees in company healthcare plans and submitting timesheets for payment. These employees may have to work with diverse earning statements, be fluent in healthcare law, and become familiar with health insurance organizations and policies. Employee Recruitment: Employee recruitment is a really important component of creating a large and diverse hospital team. Professionals that work in this area may be responsible for posting job openings, conducting interviews, and recommending employees for hire. Part of this position’s responsibilities may include creating attractive job posts, ensuring diverse and all-inclusive job descriptions, and conducting interviews that can display the positive traits of upcoming employees. As a human resources professional in healthcare facilities and hospitals across the country, you could be a part of active teams that work hard to ensure the health and wellness of communities. Your position within hospitals may be vital to the success of your agency, since it is such an important component in maintaining employee income, benefits, and fair treatment. Employees that are entering into new positions can seek your guidance to learn more about their role in the company’s success, as well as continued training throughout their employment. Our team of educational experts has researched some of the most popular career choices for individuals in this field. The list below represents their findings, which show the annual average income of each position. As you can see, there are many different options for you to pursue with a degree in human resources, each of which can provide a great potential for earning throughout your employment. Read more about these average salaries below. What does a healthcare human resources professional’s day look like? Professionals that work in the field of human resources are a very important part of the healthcare team. In hospitals and healthcare centers all over the country, human resource professionals are leading the hiring process for new employees, conducting training to help staff stay on track with their practice, and intervening in the instance of conflict or rights violations. A normal day for individuals in this field may be very diverse, but is often filled with working towards supporting employees and their benefits for working in the healthcare field. Will I work individually or with a team? 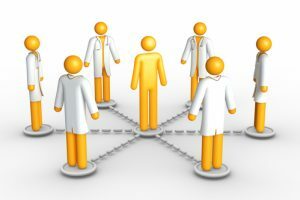 Depending on the size of the healthcare facility you work for, you may work alone in your own area or with a large team of other professionals. Healthcare facilities that have large numbers of employees often employ several human resource professionals to help keep up with the large demand. Human resource professionals may work in a team and have a central leader to help guide them in the event that work gets overwhelming. Smaller facilities may employ 1 or 2 human resource professionals to help organize their personnel files, training, and compensation. Why do hospitals need human resource professionals? The test of time may have taught healthcare facilities (as well as most business entities) that managing patient care and employee intake may be too overwhelming for just a small pool of people. Human resources professionals are responsible for ensuring that employees are getting proper care, training, and services from their employer. While this may not seem like a large task, the intake and turn-over of hospitals and other medical centers may be extremely large. This marks the need for a special class of professionals that can manage this aspect of business without hindering other professional fields.